OK - I will have a TON of awesome pics from this weekend posted very soon! It was a crazy/awesome one, so I will definitely be sharing all of the shenanigans with you. First off though - I tried out a recipe Saturday night that I found in Real Simple Magazine a while ago, and it turned out really delicious! Obviously, I subbed fake-bacon for real bacon - and this was one of those situations where I wish I could have the real thing! But although it would've been really awesome that way, but I love piggies way to much. 1. Cook rice according to package directions & set aside. 2. Meanwhile (while rice cooks), cook the bacon in a large skillet over medium-high heat until crisp, 5 to 7 minutes. Transfer to a paper towel, let cool, then break into pieces. Wipe out the skillet. 3. Heat the oil over medium-high heat. Add the onion and cook, stirring occasionally, until softened, 4 to 6 minutes. Add the wine and cook until reduced by half, 2 to 3 minutes. 4. Add the cream and bring to a boil. 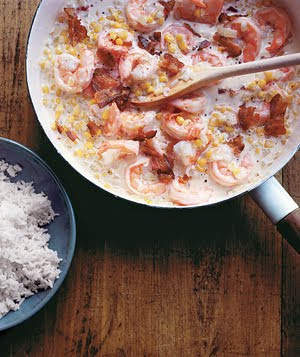 Stir in the shrimp, corn, and 1/4 teaspoon each salt and pepper. Simmer until cooked through, 4 to 6 minutes. Stir in the bacon; serve over the rice.